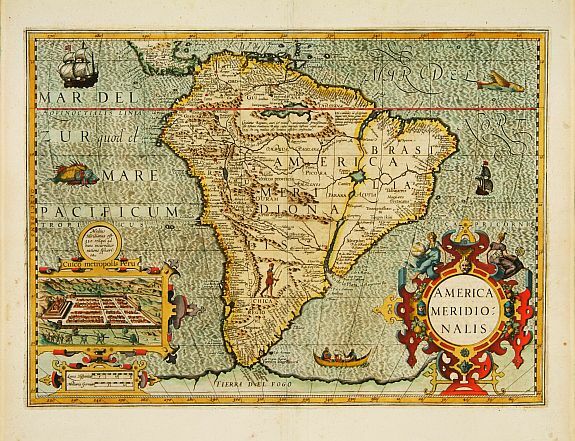 27 MERCATOR, G. / HONDIUS, J. America Meridionalis. ( Amsterdam, 1630) Beau col. - A good and strong impression. Paper slightly age toned, as usual. 356 x 489 mm. � The eastern part of Brazil is depicted as an island: a huge Rio de la Plata extends from the Atlantic in the south to a large lake, Eupana Lacus. From this lake the Rio Grande flows further northward into the Amazon river and from there into the Atlantic. In an inset a view of Cusco, the Inca capital. 28 BLAEU, G. Peru. ( Amsterdam, 1640) Beau col. ancien. - In very good condition. The map is lavishly coloured using gold for the cartouches and further embellishment. 375 x 490 mm.